So on Thursday I was trying to get out of Dog Valley before the rain hit and lost the road befor I could turn around I found myself stuck. Think someone with a winch could help me get back up to the road once the weather clears and the roads get slightly better? 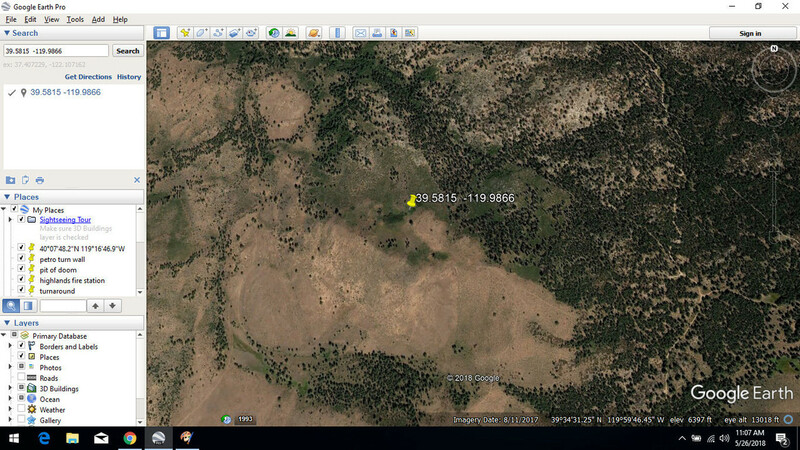 GPS coordinates are 39.5815 lat -119.9866 long. dude... Im willing and able to help but I need more info.. phone #, what are you drivng? (moms honda or dads rock crawler on 40's? ), do you have any recovery points?? Ill come help to if this inst an all out goat rope. LOL...SAR rescued these two very early Friday morning...…..and yes, they are on the side of a hill...…. Im busy Sunday however Monday would work if the vehicles owner were available to navigate the way. His profile lists his ride as a 2015 wrangler so assuming we can reach him we can extract him. CharlieMan rig is a 2015 jeep wrangler with no lift and 32” tires the bumper I have on the back has recovery points if I get a c shackle on it and there’s a road that’s hard to see that ends hear. *edit if the pic won’t load I’ll read it to the thread when I get to a pc I’m on mobile right now. I could navigate to it and Monday is actually the best day as it’s my day off. We are going to stage in Bordertown at 10am (monday 5/28) and go in through cold springs. It would be cool if someone else could join us so we could pull each other out should the worst happen. lets go get this fellow Jeeper. She’s out! Thanks again CharlieMan for all your and your brothers help. Wholly mollly. Worst stuck award there. How you got a stock JK up there I'll never know! NPS Input Needed for Death Valley's Saline Valley and Warm Springs!